Modena by Fraser Bangkok, a new hotel residence located in the heart of Bangkok’s business district, enlisted award-winning designer Ploenchan ‘Mook’ Vinyaratn to bring a “localized experience” to the interiors of the 239-unit property.A key uniqueness of Modena by Fraser Bangkok lies in its art and design pieces, which not only draws inspiration from the surroundings, but also complement the local environment. “By infusing local touchpoints into the property, the art and design installations serve as a talking point between our staff and guests. Not only do they allow our guests to enjoy an authentic experience within Modena by Fraser Bangkok, but we also see them snapping pictures of it to post on their social media. It naturally becomes a conversation piece,” said Prema Irangani, General Manager of Modena by Fraser Bangkok. The surroundings of Modena by Fraser Bangkok, at the bustling corner of Rama IV Road, and nearby the famous Khlong Toei Market, provided the initial inspiration for Mook’s designs. Mook brought all she had learned within her 20 years of experience in interior design to create Modena by Fraser Bangkok’s masterpiece, ‘Took-a-Tuk-Tuk’ – a huge textile piece that takes pride of place in the lobby. The monochromic treatment and staggered panels lend a kinetic flow to the depiction of Thailand’s iconic mode of transport. “‘Took-a-Tuk-Tuk’ is almost an abstract rendering of the common form of transport you see around the market, like a ghostly afterimage of a passing trike. It was sewn and embroidered mostly by hand at my factory and I personally oversaw the installation at the hotel. I wanted a contrast, which is monochromatic, emphasizing a sense of motion, adding to the unique panels. When you look at it you should almost hear the revving of the tuk tuk motor,” said Mook. 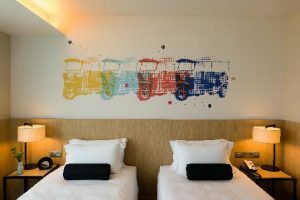 Most of the other “Thai touches” at Modena by Fraser Bangkok come courtesy of a selection of simple and clean pop art graphics that adorn guestroom walls. Clearly inspired by local scenes, images include stylish and brightly-colored paintings of motorcycle taxis, and market vendors carrying traditional woven baskets. ‘Fresh Market’, an art piece behind the reception deck is hard to miss. A huge eye-catching piece that somehow manages to capture the riotous colors, odors and textures of the Khlong Toei Market and is, in a way, an ode to the institution of food-obsessed Bangkok. “I am very used to working with vibrant colors, which is what I did with my ‘Fresh Market’ piece. This artwork also features seafood that you would typically find at the nearby market,” said Mook. 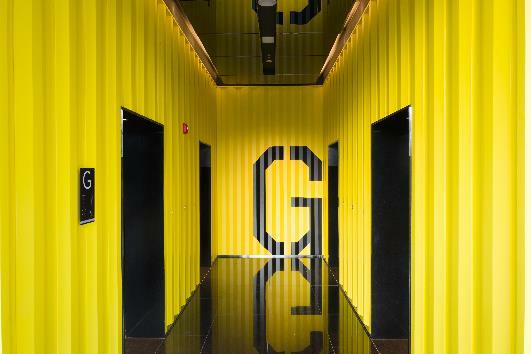 Modena by Fraser Bangkok also summons the local spirit of the nearby Khlong Toei Port in its use of bright yellow walls on the ground and second floor that resemble containers. 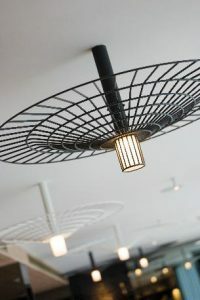 The second floor, which contains all-day dining and meeting room facilities, also features beautiful suspended pendent lights, which resemble upturned umbrellas commonly seen in the fresh market. Clever use of timber screens and timber pattern flooring creates an atmosphere of a timber yard in further reference to Khlong Toei’s industrial identity. 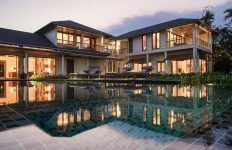 It is in the location of Modena by Fraser Bangkok itself, however, that allows for plenty of opportunities for its guests to enjoy a localized and real experience. Modena by Fraser Bangkok is the first Modena by Fraser property outside of China, which is where the brand debuted in 2010. There are five other Modena by Fraser properties currently operating, in Shanghai, Suzhou, Wuxi, Wuhan, and Changsha. 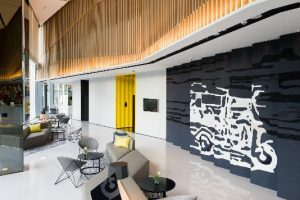 Modena by Fraser Bangkok adds to Frasers Hospitality’s portfolio in Thailand where it currently operates the 163-unit Gold-Standard Fraser Suites Sukhumvit serviced residence in central Bangkok. Frasers Hospitality’s global portfolio, including those in the pipeline, stands at 140 properties and more than 80 cities and 23,400 keys worldwide.